I was at a friend’s house recently, and as we were talking about my experiments with making casein, she complained that she had some dry “instant” milk powder she had bought for her young son, but he didn’t like the taste. She let me take it home to experiment with, since I had never tried making casein from a dry powdered milk before. I followed the instructions to re-hydrate the powder by adding 3 3/4 cup of water (distilled) to one package, 3.2 ounces, of powder. This made about 4 cups of milk. I used a blender to mix it well, and set it in the refrigerator for 24 hours. The next morning, I poured the milk into a pot, and heated it on the stove to @150 degrees, turned off the heat, and added 1/2 cup of distilled white vinegar. Stirring for a couple minutes it congealed into a ball of casein. So far so good. I removed the ball of casein and filtered the liquid through cheesecloth to catch as much extra casein as possible, and then tore up all the casein into small pieces so it would dissolve more easily. In the picture below is a bowl of about 2.5 ounces of casein from the 4 cups of instant milk. 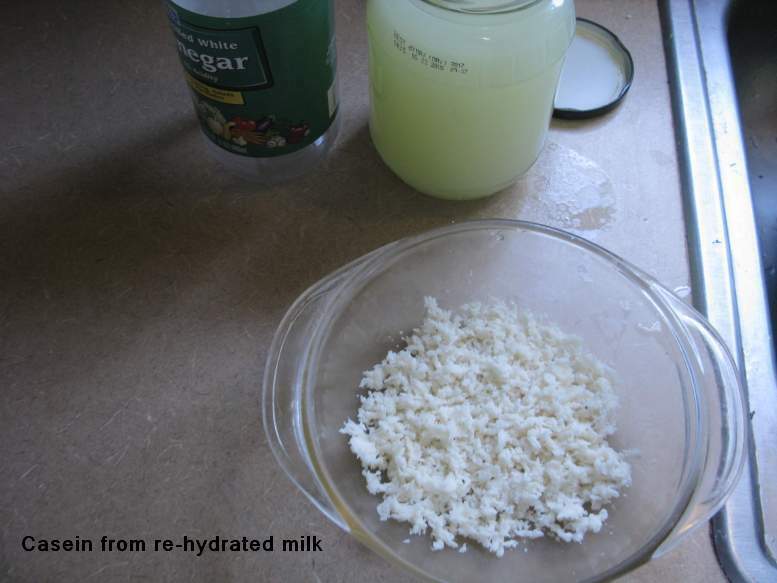 I rinsed the casein in clean water a couple times to remove as much of the vinegar as possible. 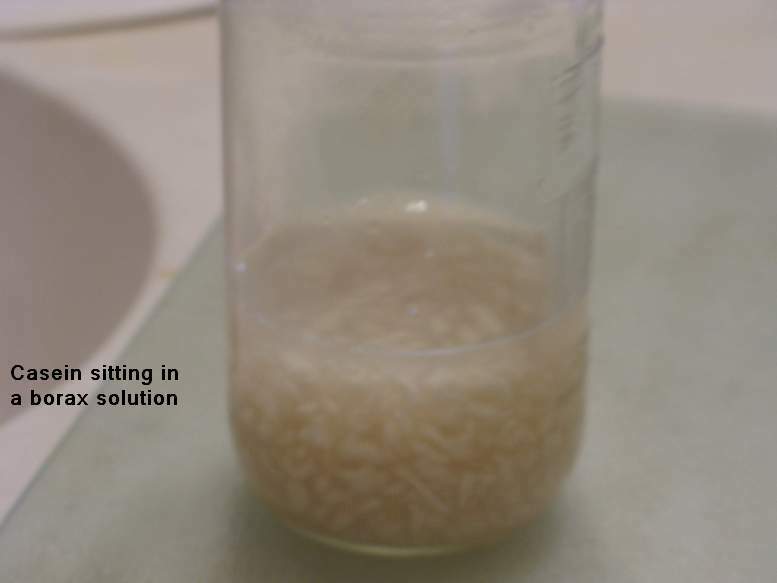 Next I placed it in a 12 ounce jar, and I diluted 2 teaspoons of borax in 1/2 cup of distilled water that I heated in the microwave for about 20 seconds, and then added to the casein. This will turn the casein into a glue gel. After about 6 hours or so the casein had started to transform into a gel, but was still a little lumpy. At this point I stirred in a drop of thymol to act as a preservative, and let it sit for awhile longer. After about 12 hours it had transformed into a very thick and stiff gel, about 1/2 cup. 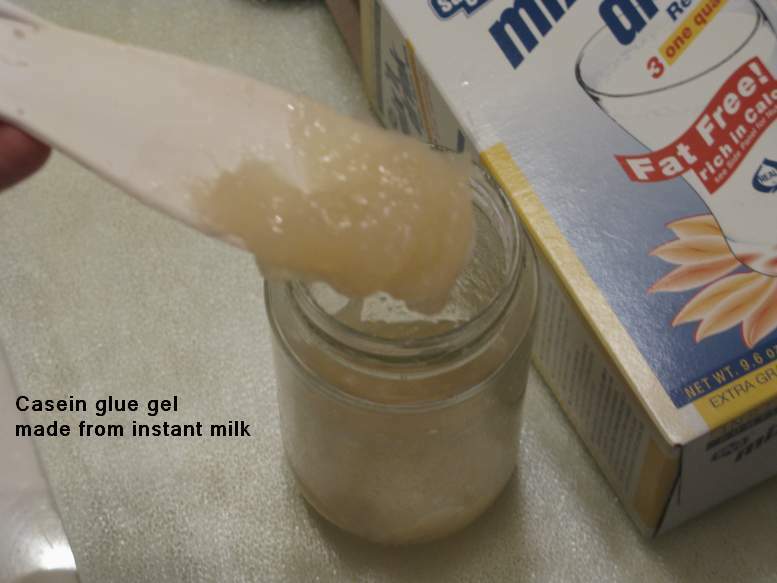 Comparing this to other casein glue I’ve made I would say the gel from raw milk is more opaque, and gel made from dry casein powder is has a slightly darker amber tone. It does feel slightly sticky, so I would guess it will work just fine for my needs in making paint, gesso, or fixative. Very encouraging. I’ll check out a few local grocery stores to see if I can find some instant milk powder that is unfortified. If not there are plenty of brands on the internet I could order. Here is one from Bob’s Red Mill, for example. The label says it has 0% vitamin A, so no Palm oil is added, and no vitamins D or E. The vitamin C is a natural milk component. 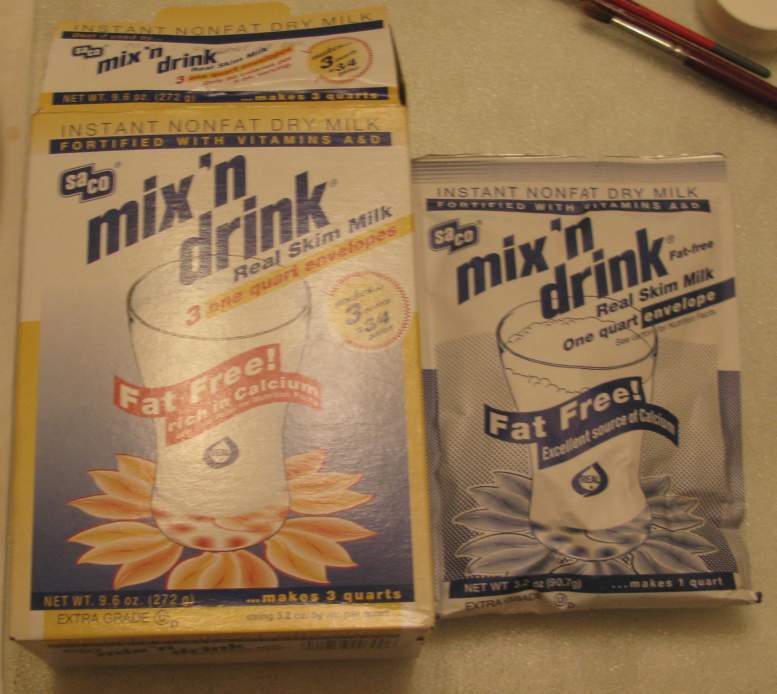 From that 22 ounce packet I should get about 4 cups (32 ounces) of casein gel. If I remember correctly, I can get about 16 ounces of gel from a gallon of fresh milk. In powder form, the milk can be stored up to 2 years. I don’t know of any studies with casein becoming like rubber. When casein dries, it doesn’t have any flexibility; just the opposite. Casein can be made into a hard plastic, so I’m sure there are all sorts of applications out there to be discovered, or re-discovered. Thanks for the lead to that book. I’ll keep an eye out for it.